This post...this post is not about Jane Austen. So why is it in the middle of Jane in June, you ask? 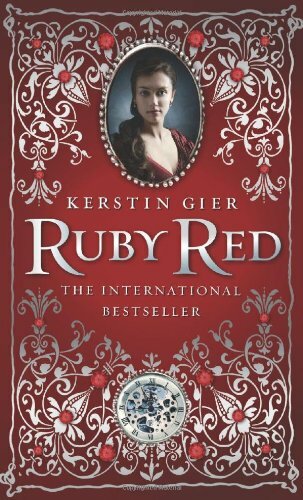 But you still want to know why I'm posting about Ruby Red, right? Oh, that's an easy one: I want to give you a copy. Courtesy of Zeitghost Media and Macmillan, I can offer one lucky winner a copy of Ruby Red! Leave a comment telling me whether you would or would not like to time-travel and why. Thanks for the giveaway! Minus any time paradoxes, I'd love to time travel, either to places of historical mystery (to solve them!) or to the utopian experiments in America during the 19th century, because those are so interesting. Time travel is really not for me. I like todays conveniences like a bathroom and a computer. I would like to win and read this book. I think I would like to time travel. As long as I can come back home again. I think it would be awesome to travel through time, as long as I didn't get caught up in any of the drama....I'd just want to be a fly on the wall to see how different things were! I love reading about time-travel, but don't think I'm brave enough to try it myself. I'd be afraid I wouldn't make it back home. Thanks for the giveaway. If I don't think about it too much, I'd love to time-travel and see some things in person. I would love to time travel...I think that I probably fit in the past more than the present to be honest. And since I am a Janeite...guess where I would go! I have been fascinated by the concept of time travel since I was a young girl. I love history and the idea of being able to see how it was, live in the era for a spell, meet the historical persons we study, and answer the mysterious blank areas we do not understand is thrilling to imagine. However, I am pretty sure I would not like to live full-time in an era before electricity and indoor plumbing! This book sounds fabulous. Thanks for the offer. I would love to time travel! Imagine being able to see important events in history unfold or even simple things like your grandparents as kids. I would do my best to not mess with the time stream because I really would not want to be responsible for any crazy paradoxes. Now if only I could secure a TARDIS. I think it would be exciting to time travel. Seeing how it was in different time periods would be interesting. Thank you for the giveaway. So excited to read this! Thanks for the giveaway! I don't think I'd like to time travel. Too much pressure. Going to the past -- you could alter the choice of history. Going to the future -- well, I think some things we just aren't meant to know. I love time traveling in novels. But I think I would miss modern plumbing too much. But oh the dresses! I think I would be afraid to time travel. Something bad might happen or I might not be able to return. I do love to read about though! I would love to time travel. Purely for selfish monetary gain and self indulgence. Wouldn't you? So I'm thinking spanish bullion. Pirate ships, adventure and romance on the high sea's. I would love to time travel, as long as I get to choose for how long I'm there. It would be so fantastic to just get a glimpse of a time period whenever I wanted! I love history so I would love to time travel. It would be amazing! I would love to time travel! I spend most of my time reading about certain time periods anyway so why not visit? I'd love to time travel-- for short periods at a time! Too long, and I'd missed my laptop and easy access to books and cars. :) Thanks for the giveaway! I've always wanted to time travel I'm fascinated with history especially the ancient Greeks,Romans and England in the middle ages. If I could I would LOVE to time travel! Yes! But I want to travel into the future! Thanks for the giveaway! I would love to time travel! There are so many fascinating times and events and people and places that I would love to see and understand, mysteries to solve and lost civilizations to explore! Who wouldn't want to time travel? I *would* like to time travel but only to eras after the advent and widespread installation of indoor plumbing. How about the 1950s? I can rock a poodle skirt! I'd love the chance to time travel. What an education it would be to go some of the locations where history was being made. I would do that in a heartbeat as long as I could come back to the present every night and sleep in MY bed. I'd love to time travel and travel to see history being made! I'd love to win a copy! This book looks wonderful! I would love to time travel into the past to learn about my ancestors. I would really enjoy to time travel. Imagine how much you could learn, the perspective would be amazing. I'd love to time travel - so I could meet Jane Austen! And Louisa May Alcott, and other female authors who inspire me. Time traveling sounds like fun except it would also be a bit scary and disorienting. I think experiencing it once would be enough for me! I would absolutely love to time travel!! I would go to the Victorian Era to meet all the amazing authors - Austen, Dickens, Brontes, Keats, etc. Time travel sounds awesome! I'd love to be able to! I enjoy modern conveniences too much to want to time-travel. o i would love to time travel, only as long as i can control it and come and go as i please. id like to know how it was back in the day and id love to explore the cities as they were first being build. it would be fasinating to see what the world was like a long time ago. thanks for the giveaway! I would definitely like to time travel. In fact, I'd like to be able to go back to 10 years ago; so I could tell my younger self to do a lot of things differently. I think I would like to time travel. There are a few things I would want to set right.